Day 6 has been producing bicycles since 2006, they offer a unique crank-forward frame design that required over five years of development testing and is now sold in multiple sizes, colors, and configurations (traditional gears and internally geared hubs). Started in Iowa by a 30 year old engineer named Kelly Hutson who had hurt his back, the vision behind Day 6 was to empower people who were suffering from hip, knee, neck, back, lower back, and bottom pain. 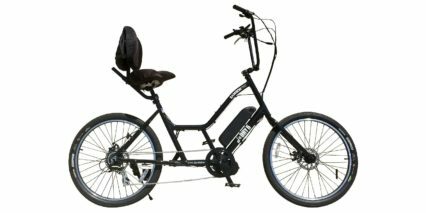 People who are obese or have physical limitations from diseases like MS can sit more naturally and now enjoy electric assist and throttle on demand power to successfully ride a bicycle again. Day 6 is an offshoot of a wheelchair seating design firm called Comfort Company and their large padded seats with back rests are unique in the e-bike industry. The name is a reference to the biblical creation story in which man is introduced on Day 6.